The California Advanced Homes Program (CAHP) and California Multifamily New Homes Program (CMFNH) have heard from participants about the increasing difficulty they experience finding laborers in today’s workforce. Recently, Builder Online posted an article about this issue. 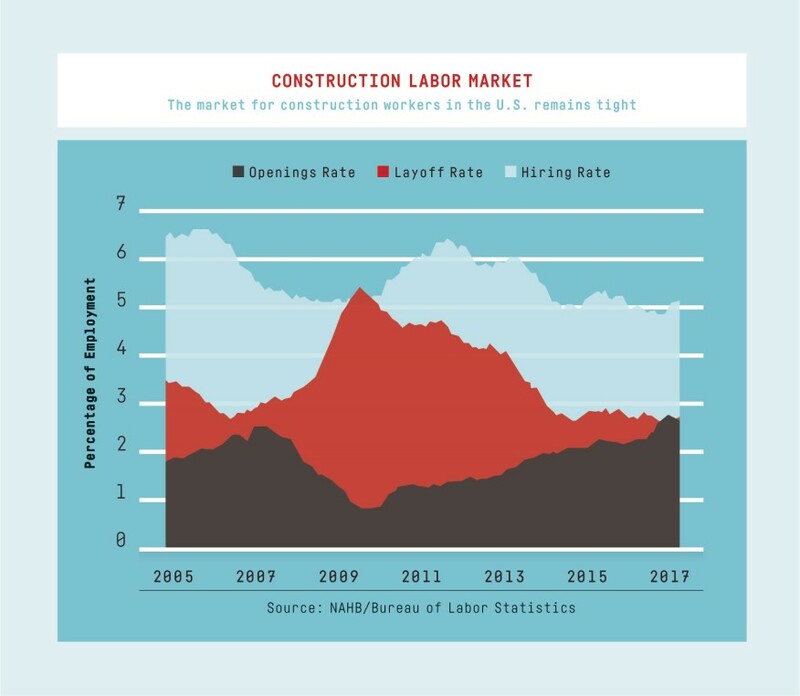 Robert Dietz of the National Association of Home Builders (NAHB) commented that the labor shortage “has been the top business challenge for the last three years, and will likely continue to be so.” Between 2011 and 2016, the number of builders who reported that the cost and availability of labor was a significant issue increased from 13 to 78 percent. CNBC also published an article about the potential acute crisis headed our way for apartment developers. Multifamily construction is currently at a 40-year high, with luxury apartment buildings accounting for 75-80 percent of the new supply. According to developers, the cost of construction is so high, that it is becoming increasingly difficult to deliver product at lower price points. Land, building materials, and labor all cost more. The Builder Online article shares tips from builders about how they work to avoid the labor shortage issue, such as creating a construction schedule that suits all parties, tweaking systems and processes to help retain laborers, and showing appreciation for and paying them quickly, among others. Working to retain laborers still does not solve the problem of how hard it is to find quality laborers in today’s work climate. One potential solution is to train the entry level labor workforce to become quality laborers. The Workforce Instruction for Standards and Efficiency (WISE) Program was designed to help accelerate learning and implementation of high performance building by training workers and providing a platform for the exchange of best practices and solutions from industry experts. Another option is to implement low labor solutions on projects. Concrete insulated panels, cross laminated timber, and other manufactured projects can all reduce the total amount of labor required. Both CAHP and CMFNH strive to improve the energy efficiency building process for participants, and we welcome your feedback on this matter to continue the conversation.